Home News Who Is Derek Fox, The Grand National 2017 Winner (One For Arthur)? Jockey Derek Fox finished first and was declared as the Grand National 2017 Winner. 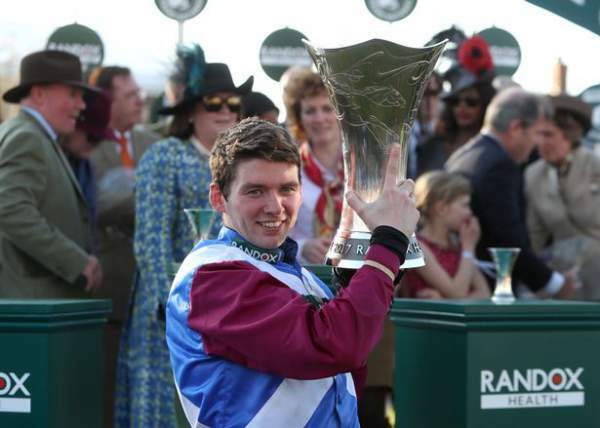 He rode One For Arthur on Saturday and won the prestigious horse racing competition. The 24-year-old suffered from his broken wrist and collarbone just a month before the contest. But, he got back in time for the racing event. The Cause of Causes, Saint Are, and Blacklion turned out to be second, third, and fourth in the race. But, do you who Derek Fox is? Let’s check out and dig deep about his roots. Fox entered the GrandNational for the very first time as a rider. It turned out to be his biggest victory in the Irishman’s 5-year career. Derek was born in Sligo, Ireland. He has been working with Scotland’s leading trainer Lucinda Russell at Kinross yard for quite some time now. He joined the Scot around 3.5 years ago when he didn’t have anything to offer and was just a complete underdog. However, he won his first race within two months of joining the yard. Check: The Grand National 2017 Results. Ever since then, he kept himself improving day by day. He took the mantle of Peter Buchanan’s stable jockey position. The 8-year-old horse, One For Arthur became the second National winner for Scotland. The first ever victory came in 1979. Fox won two times in One For Arthur’s saddle earlier this season. With good news, he had some bad news in the past too. In 2015, Fox was banned from driving for 20 months when he was found drinking-and-driving nearly 3-times more than the legal alcohol limit. Stay tuned to TheReporterTimes.com for latest sports news.